Man and science have always been in search for an elixir for eternal youth. Well, such a thing may not exist. Experts claim that only 30% of aging is genetic, while the rest of 70% depends on the choices we make in our lives. If you want to stay young for longer, try these unusual tips to maintain your youth and vitality. • Use turmeric in your cooking: A substance called cucurmin in turmeric revitalizes your skin, reduces scars and improves overall skin health. • Eat greens along with other healthy foods: Greens are rich in folic acid, iron and vitamin A and these nutrients help in preventing cancer and stroke. • Eat a balanced diet: Neither eat more nor less. Studies show that those who eat a balanced diet stay healthy and live longer. • Eat tomatoes and porridges regularly: Tomatoes, being rich in lycopene, protects skin from sun burns and sun related aging. Porridges are rich in fiber and those who eat fiber rich food can keep away heart diseases and digestion problems. They also reduce the risk of premature death by one fifth. • Walk regularly: Experts say that walking everyday reduces depression which is one of the causes for wrinkling of skin. • Do squats and lunges: Due to lifestyle changes, many people suffer from chronic back pain aging may lead to back injuries. Doing squats and lunges regularly strengthens your back. • Party often: Partying doesn't always mean booze. It is spending quality time with family and friends. Socializing more reduces dementia by 50% in old age. • Avoid loneliness: Studies show that those who show high levels of loneliness decline physically faster compared to those in a good company. • Shop more: Taiwanese researches show that people who shop daily were at 28% lower risk of premature dying than those who shopped the least. • Culture a hobby: Hobbies describe a person's creativity. It is said that creativity enlarges neural networks in the brain, keeping your brain active and healthy. 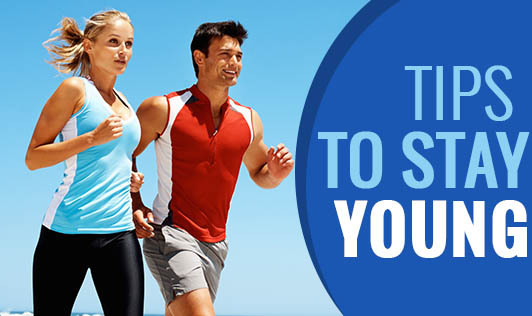 • Exercise your mind: British Longevity Society says that exercising your mind in fun ways is beneficial. Solve crosswords, word puzzle etc. These are just a few tips. Always live and relish every moment of your life!